From Anchorage: Follow Tok Cutoff (Rt1) towards Tok. Approximately half a mile before Tok Junction, just after the speed limit drops to 35 MPH, turn left on Borealis Ave. We are half a mile down Borealis Ave on the left. From Fairbanks: Follow Alaska Highway (Rt2) south. At Tok Junction turn right on Rt1 towards Anchorage. Approximately half a mile from Tok Junction, turn right on Borealis Ave. We are half a mile down Borealis Ave on the left. From Canada: Follow Alaska Highway north. At Tok Junction turn left towards Anchorage. 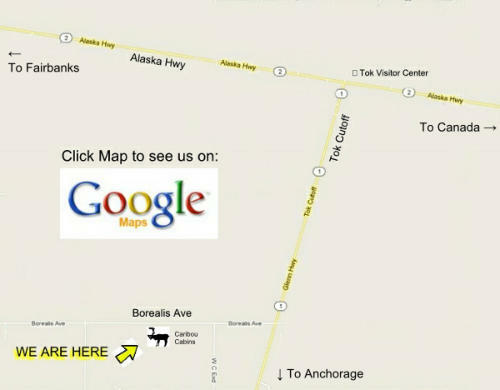 Approximately half a mile from Tok Junction, turn right on Borealis Ave. We are half a mile down Borealis Ave on the left.